From The Age newspaper in Australia, via Drive.com.au, comes this surprising, sobering “anatomy of a crash,” the car in question being the 5-star Ford Falcon (the one made in Australia, not the one your father had when he was young). The article leads by noting: “Survivors of serious car crashes often say time appears to slow down in the moments around the impact and that they can recall the event in extraordinary detail.” (and somehow the images we always see of crash-test dummies in slow motion tends to reinforce that). “This is a reconstruction of a crash involving a stationary Ford Falcon XT sedan being struck in the driver’s door by another vehicle travelling at 50 km/h. One millisecond equals 1/1000th of a second. 0 milliseconds – An external object touches the driver’s door. 1 ms – The car’s door pressure sensor detects a pressure wave. 2 ms – An acceleration sensor in the C-pillar behind the rear door also detects a crash event. 2.5 ms – A sensor in the car’s centre detects crash vibrations. 5 ms – Car’s crash computer checks for insignificant crash events, such as a shopping trolley impact or incidental contact. It is still working out the severity of the crash. Door intrusion structure begins to absorb energy. 6.5 ms – Door pressure sensor registers peak pressures. 7 ms – Crash computer confirms a serious crash and calculates its actions. 8 ms – Computer sends a “fire” signal to side airbag. Meanwhile, B-pillar begins to crumple inwards and energy begins to transfer into cross-car load path beneath the occupant. 8.5 ms – Side airbag system fires. 15 ms – Roof begins to absorb part of the impact. Airbag bursts through seat foam and begins to fill. 17 ms – Cross-car load path and structure under rear seat reach maximum load. 20 ms – Door and B-pillar begin to push on front seat. Airbag begins to push occupant’s chest away from the impact. 27 ms – Impact velocity has halved from 50 km/h to 23.5 km/h. A “pusher block” in the seat moves occupant’s pelvis away from impact zone. Airbag starts controlled deflation. 30 ms – The Falcon has absorbed all crash energy. Airbag remains in place. For a brief moment, occupant experiences maximum force equal to 12 times the force of gravity. 45 ms – Occupant and airbag move together with deforming side structure. 50 ms – Crash computer unlocks car’s doors. Passenger safety cell begins to rebound, pushing doors away from occupant. 70 ms – Airbag continues to deflate. Occupant moves back towards middle of car. What’s fascinating about all this is not simply the rapid fire technology at work (I’m still trying to deal with that computer deciding whether it was a shopping trolley or another car that has struck), but how much has gone on before we even register it — and this at 50 km (31 mph), so you can imagine what’s happening at higher speeds — even though in our subsequent reconstruction of events we may have imagined that time actually slowed down the during the event. In other words, because of the nature of the event, people may have had, essentially, more of a memory of it, so when they later thought of it, it took longer to “replay.” But in the case of the Falcon, the event was essentially over before the driver would have realized what was happening. Comments Off on All Over in the Blink of an Eye (but Not the Mind’s Eye). Click here to leave a comment. An alert reader sends along some more coverage, this time by Isabelle de Pommereau in the Christian Science Monitor, of Bohmte, a German village that has become another waypoint in the evolving “Shared Space” movement (I was in the town a few years ago, for a Shared Space conference, but haven’t been back since things were changed). 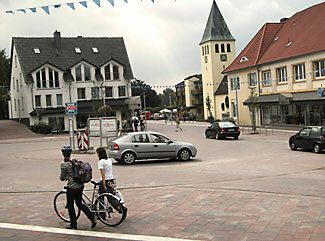 The town, like many, felt overwhelmed by the 13,000 vehicles per day coursing through its small center. Comments Off on “The Whole Village Has Become More Human”. Click here to leave a comment. Comments Off on Offsetting Behavior?. Click here to leave a comment. They give the enemy clear directions. 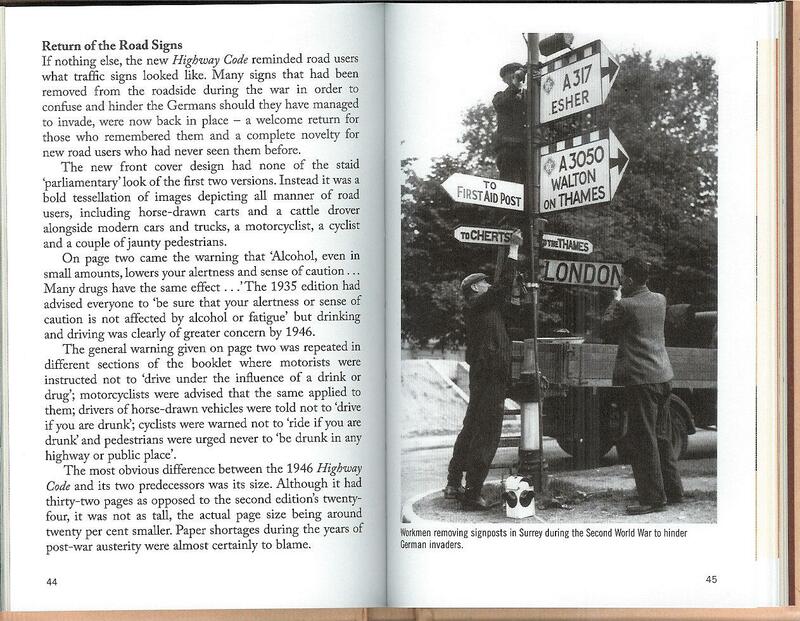 This from the wonderful little book, The Original Highway Code, which reprints earlier editions of the perennial British bestseller. Comments Off on Another problem with traffic signs…. Click here to leave a comment.